Steven Epp and Jamal Abdunnasir in The Moving Company’s production of Refugia. Photo by Dan Norman. Hang around the Twin Cities theatre scene long enough and the name Theatre de la Jeune Lune is sure to come up. Since that ensemble dissolved in 2008, its performing space became Aria at the Jeune Lune (host of innumerable weddings, parties, and special events), while founding co-artistic director Dominique Serrand went on with several of the ensemble’s core members to start The Moving Company. While that title might suggest a number of burly men coming to help move your couch, this new ensemble has become its own, internationally renown voice in theatre. A safe place where one can survive when otherwise faced with extinction. How do you gain permission to enter refugia or permission to leave the place where you face extinction? Is being a refugee a personal choice or a role thrust upon oneself by circumstances? These questions are explored with intellectual fervor in the form of monologues, tableaus of ensemble movement, satirical characters, political discussion, dramatic scenes, a fairy tale, and a little bit of multimedia. The work opens with an amazing monologue by Steven Epp as he relates the story of himself at the present moment on stage. He leads us into the future with himself as an elderly person ushered by his family into an assisted living space with rather absurdist tendencies. It is here that he realizes his transformation into a refugee, seeking protection from the outside world as he slowly dies. Next, the audience finds itself facing the fence along the U.S.-Mexico border. A child peers through struts in the fence from the Mexican side. She wears a sign around her neck with the word “Help” written on it in English. So begins a satirical look at the Border Patrol bureaucracy that agonizingly ignores the child until just before quitting time. Rendah Heywood and Orlando Pabotoy. Photo by Dan Norman. A startling and insightful take on what it means to be a refugee is the scene portraying a Russian couple (Nathan Keepers and Christina Baldwin) at a train station in the USSR. The husband is an accomplished composer creating far-reaching work in new modalities of music. His wife is a classically trained singer. They are allowed to go to Israel…but the composer must leave all his music behind and both are stigmatized by the stateas useless. The only story to be carried through more than one scene is about the parents of a young man who has gone off to join ISIS. The parents are immigrants from Algeria living in southern France. They wonder what they can do to dissuade their son from turning to terrorism. The mother (Rendah Heywood) brooks no argument when she insists that her husband (Orlando Pabotoy) travel to Syria in search of their son. Despite finding his son, the son becomes a refugee who cannot go home. The final scene of the performance is quite a let down from the engrossing themes of the previous scenes. The scene, though light-hearted, is not very humorous and only serves as a distraction from the weightier themes. 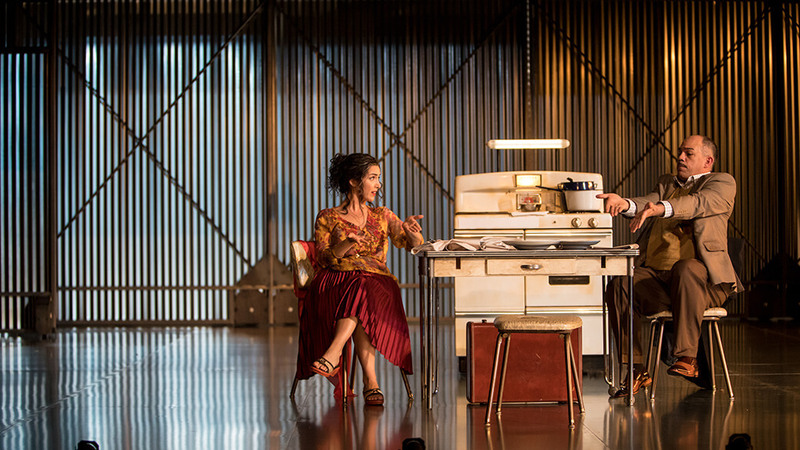 Set Designer Riccardo Hernández provides the group with a clean space and a set designed to make the stage seem cavernous. The set also has subtle background projections and the title of each scene projected overhead. Within this space the performers move, portray characters, and speak of refugia as it has been experienced by many people in many different cultures. 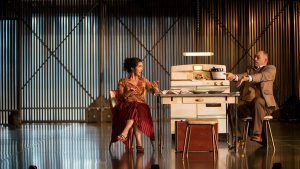 Refugia plays through June 11 at the Guthrie Theater’s McGuire Proscenium.